Select all (Command + A) and holding down the shift key resize your portrait to fit on the artboard. Present your Final Project : Chromatic Portraits to the class as a committed, professional designer. Why you chose the color reference you did? How does the choice of palette affect the psychological mood of the portrait? Check your grade next Monday. If you have questions or concerns, let me know right away. This entry was posted in Class 15, Lecture on December 16, 2009 by admin. This entry was posted in Class 14, Lecture on December 9, 2009 by admin. Optimize your image in photoshop by reducing the number of levels in the continuous tone, first by adjusting the levels, converting to Black & White, and then by using either Adjustments > Posterize, or Filter > Cutout or a combination of the two. Try to keep as much detail as possible, while isolating the shapes that define the form > midtones, highlights, and shadows. Those more advanced students may wish to work directly from the photograph, though creatively simplifying the composition. Place your photograph on a tracing layer and take some time to decide how you will realize the composition. A good first step is to create layers for each major area and then use your pen tool to block out the main areas of base color in each major area. In Outline mode begin tracing the mid-tones, shadows and highlights that define the structure of your face. Avoid drawing lots of little shapes at first, instead create broad solid shapes. You will toggle between OUTLINE and PREVIEW mode in order to achieve accurate curves. Remember to save and label your color swatches. You can use the Eyedropper + Shift to select values from your bitmap image. We will be creating our own color palettes later in the project. One good technique is defining all of your midtones and saving those swatches to the swatches palette. Then use HSB and add white or black to develop the highlights and shadows. When you have defined the broad areas, go in and start to develop the more detailed areas. Create closed paths using the pen tool and basic shapes. Use pathfinder and other commands to transform your objects as needed. Set up your Final Project file as described above and have all the major tonal changes defined: midtones, highlights and shadows- starting with the definition of large, broad areas first. Bring a color reference to class- this can be an advertisement, a photograph, or a physical object of your choice. This entry was posted in Class 13, Lecture on December 2, 2009 by admin. Create a typeface worksheet, if you haven’t already. Come prepared with the following files for Assignment #4. We will begin work on the final project next week! This entry was posted in Lecture, Week 12 on November 25, 2009 by admin. This entry was posted in Lecture, Week 11 on November 18, 2009 by admin. Please use the Check Your Grade link to receive your midterm and pre-midterm assignment grades by email. If you know that you turned in work or if you have questions about your grade, do not worry. Please see the Prof. after class. This entry was posted in Grades on November 16, 2009 by admin. This entry was posted in Lecture, Week 10 on November 11, 2009 by admin. EMAIL ME YOUR NAME, LAST 4 SS#’s, and PREFERRED EMAIL. Last Week’s Propaganda Postcard Winners!! Drop reworked Midterm Projects in the dropbox. Create a black and white symbol for yourself, one that embodies your identity as a professional. Present your Midterm Project : Plastic Propaganda Postcard to the class as a committed, professional designer. Does your tag-line, illustration, and 1-line description/solution adhere to the project guidelines? Does your imagery support the tag-line? Is your plastic propaganda postcard convincing? Do you know your project topic backwards and forwards? Are speaking in a clear, professional, confident manner? Choose one logo, print it out and and in your sketchbook, mount the logo and write a paragraph discussing why it is successful. This entry was posted in Class 9, Lecture on November 4, 2009 by admin. This entry was posted in Class 9, Lecture and tagged Output, Printing on November 4, 2009 by admin. Present your work-in-progress to the class. Re-read the Midterm Project Description to make sure you have followed the guidelines. This is a MAJOR factor in your grade. A beautifully crafted project is great, but useless to the client if it does not fulfill the client needs/goals. This entry was posted in Class 8, Lecture on October 28, 2009 by admin. Review past student work (WPA Posters & Book Covers) for reference. Set Up your document using the file, color swatches and fonts provided (midterm.zip) and create a template layer for your sketch. Define your Color Scheme based on your research (find imagery from websites, other illustrations, etc.). Your final illustration should have a well-considered and consistent color scheme with named swatches. Mix and add new color swatches to your palette. Use the Color Guide to experiment with different color relationships. Begin by working in Outline View and using the pen tool or basic shape tools block out the largest areas of your illustration, using layers for organization. Create a layer called Background. On this layer block out the background shapes (ground, sky, etc.). Toggle to Preview, Select each object and apply a fill color from your color swatches. You will continue to build up your illustration subjects by defining the changes in value using shapes for highlights, midtones and darks. This process is similar to building a paper collage. Limit your use of stroke, opting for the development of form using filled shapes. By end of class have your project file organized (layers, template, color palette, guides) and main areas blocked out. Midterm Project Work: considerable work toward completion of project. Be prepared to present your work in progress for review. This entry was posted in Class 7, Lecture on October 21, 2009 by admin. Come prepared to share your ideas with the class. This entry was posted in Class 6, Lecture on October 7, 2009 by admin. Using the illustration you created for your Shape Relations project homework, add color and save out 4 new illustrations using the following guidelines. Split-Complementary: One hue plus two others equally spaced from its complement. Triad: Three hues equally positioned on a color wheel. Analogous: Those colors located adjacent to each other on a color wheel. >> Use one of the 4 color relationships above. Remember to save often while you are working on your drawing and back up your work in more than one place. Label your files with your name and the title. This entry was posted in Class 7, Lecture on September 28, 2009 by admin. The way monitors display color and the way printing presses produce color are different. A color monitor creates color by adding light to change a black-appearing screen, whereas a printing press uses transparent colored inks on paper. 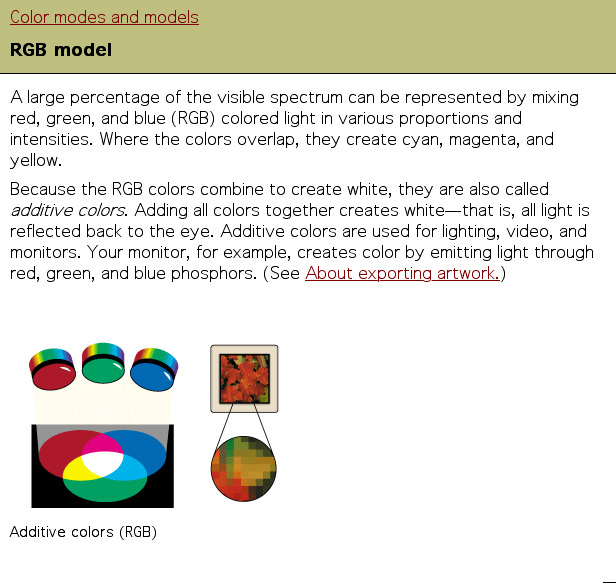 The RGB model is used to reproduce the spectrum of visible light. A monitor transmits light in this way. It’s called the additive primary model because the absence of all light is black. To create different colors you must add levels of the primary colors (Red, Green and Blue). 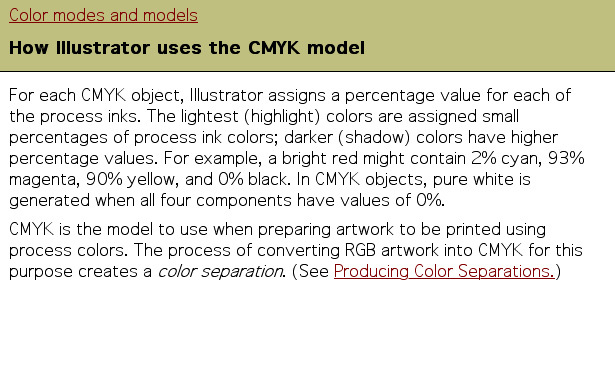 The CMY model represents reflected light or the colors you see in printed inks, photographic dyes, and colored toner. 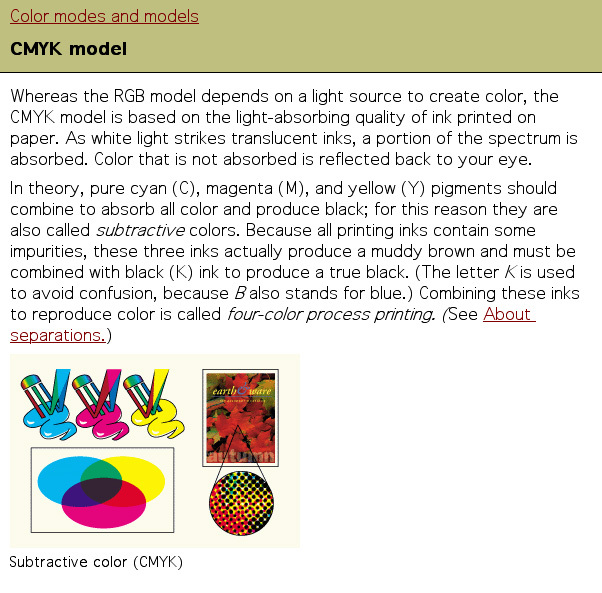 CMY is called the subtractive primary model because full values of the primary colors (pure Cyan, Magenta and Yellow) produce black and in order to produce different colors you must reduce the levels of the primaries. The inks filter out certain colors of light while reflecting others. If the ink pigments were perfect, combining cyan, magenta and yellow would produce a pure black. However, the inks are not perfect so black ink (K) is also added in the printing process. For example: the yellow ink absorbs all the blue light and generates a mix of red and green light that we recognize at yellow. 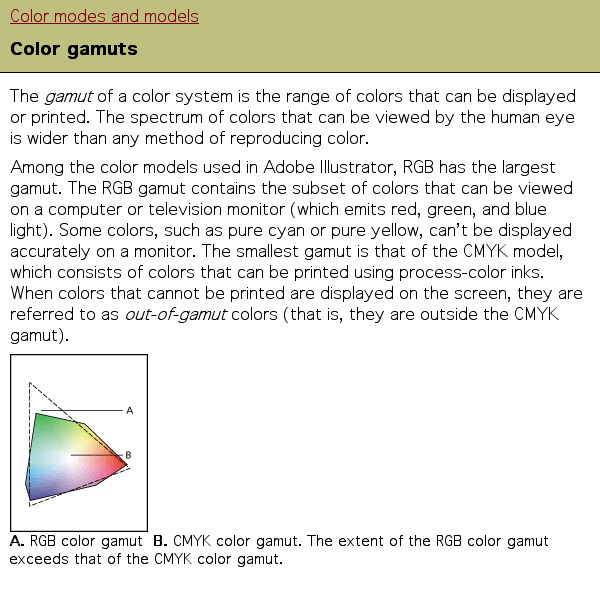 Color Gamut: Because CMYK represents a much smaller range of color than RGB it is impossible to reproduce all the colors that appear on your monitor. 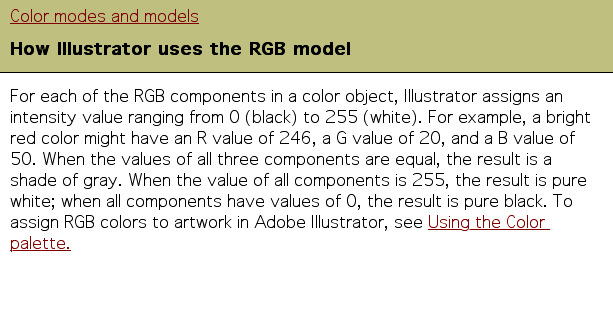 When you convert RGB to CMYK in order to reproduce the colors in print, many of the values will change. This is why it is critical to reference a printed Process or Spot color chart while creating/adding color to an image in Illustrator. When two colors of one model are combined to create a color of the other, there’s one left over. This is known as the new color’s complement. Understanding component and complementary colors is useful when working with a color image. In the four-color printing process, patterns of many tiny overlapping dots of color are used to fool the eye into seeing a full range of color. 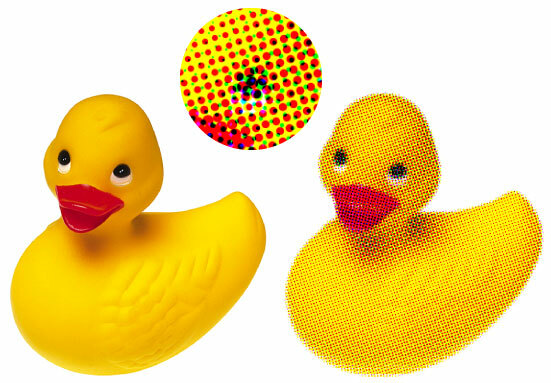 Unlike the additive color of a computer monitor, whose dots remain the same size but vary in brightness, printed dots of subtractive color vary in size or in the number of dots per area. The four color dot patterns are printed at angles, never parallel with one another. Color separations are created from your Illustrator document (separated into Spot and Process (CMYK)) colors which are then printed to plates for printing on a 4 color press. A Spot color appears on it’s own plate after color separation. It can be a color you mix or that is pre-mixed from a matching system like PANTONE. If you mix your own Spot Color in Illustrator make sure you choose Color Type: Spot Color. Spot inks are usually used because of budget (your project may only be one or two colors, which costs less) or color fidelity (you add spot inks to a 4 color job compensating for the colors that cannot be produced by CMYK, like metallic inks, or florescent). You generally don’t use more than one or two spot colors in a 4 color job. A Process color, on the other hand, is printed from 4 plates, one each for Cyan (C), Magenta (M), Yellow (Y) and Black (K). You enter the process color percentages yourself or you can choose from pre-mixed process colors from matching system like PANTONE, TRUMATCH, etc. Process printing must be used for any document that has continuous tone images. Budget permitting, a spot color plate can be added on top of a four-color process job. The most important difference between Spot inks and Process inks is that Spot inks are opaque and Process inks are transparent. When you combine (or overprint) transparent CMYK inks, the visible light that reflects through them results in a variety of colors. When you overprint opaque Spot inks, the result is a muddy pigment mush. So CMYK inks are standard when printing full color print reproduction. Because you have these two disparate ink types, the methods you employ when adding color to your document determine the end result. There are some restrictions on what you can color and the colors you apply to which objects. We will cover Trapping in a later class. This entry was posted in Class 5, Lecture and tagged Color on September 27, 2009 by admin. Idea suggestions for midterm project. Use the following translation tools to translate your name (or a name close to yours). Right-click on the image(s) and save them to the name_exercise_TEMPLATE folder. In some cases you will need to download each letter individually. Locate your image(s) and place your translated names on the template layer. Do this for each image. Lock the Template layer and choose the unique Working layer for each language. Set your view to Outline and your fill/stroke to fill of black and a stroke of none. Recreate each name using the pen tool using a minimum number of anchor points and lines. When you are finished hide the Template layer and save. Recreate the logo using basic shapes, modifier tools, outline path, outline stroke and add to shape. No stroke. Create the car using the pen tool and a combination of closed and open paths. Finish Name Project started in class and any Extra Credit. Based on corrections and discussion in class, improve your pen tool homework from last week. This entry was posted in Class 4, Lecture on September 23, 2009 by admin. Put illustrations in the Dropbox with proper file naming convention. Drag the week03 folder to your desktop. Make at least 6 thumbnails in pencil of free-form shape relationships. Start with one shape and the create another shape that follows the path of the first. This entry was posted in Class 3, Lecture on September 16, 2009 by admin. Introduction to ADGA Server Access. The ADGA server will be used to retrieve files for in-class demos, homework and projects. We will also use the server to turn in all assignments in the DropBox. All files placed in the DropBox must be properly labeled per project guidelines in order to receive credit. (jspevack > public > ClassFiles > week02). Review Tools palette (pdf) and Interface Intro. Open the interface_intro folder and open the Illustrator file. Setting up Illustrator Preferences, Document Settings, and Views. Open paths are paths that have two distinct end points, with any number of anchor points between them. Closed paths are paths that are continuous. These paths have no start or end, they just continue around with a distinct inside and outside. In this Lab we will create an illustration with the shapes, selection, and modify tools. We will get an introduction to measurement, stroke and fill, swatches, layers for organization and file formats. Download the LAB files here. Or from the ADGA2 Server (Week02). Complete the pencil and shapes chart. Drop them into the AD360_dropbox on the ADGA2 Server. In Illustrator create a new document with the Document Profile: Basic CMYK. Based on the sketches you created last week create a black and white illustration of your favorite food using only basic shapes and line tools. Use the measurement, selection, and modify tools we used today in our class demo. Your illustration, while limited to by the constraints of the project, should express your unique voice or graphic style using basic design principles. Your illustration is due in the DropBox at the beginning of the next class meeting. Review this former student’s work for reference. Download AI file here. This entry was posted in Class 2, Lecture on September 9, 2009 by admin. Your life goal or philosophy (no, really– seriously). Describe your favorite food — and why it’s your favorite*. Do not say the name. * “It’s cool”, or “I like it”, or “It’s tasty” are not acceptable descriptions of why. Course goals, syllabus, grading policy, course materials, ADGA server access, and labs. Study Illustrator Introduction (PDF) handout. In your sketchbook, designate 3 pages for a new project. Think about and/or eat your favorite food. On page 1, write down the name and a description of the food. Find or take 3 photographs of your favorite food – print them out. On page 2, add images (glue/tape). On page 3, make at least 6 thumbnails in pencil of your favorite food. Bring your sketch book to class. This entry was posted in Class 1 on September 1, 2009 by admin. Vector images are created using a collection of individual objects composed of precise points connected by lines or curves. Each individual object contained in a vector image is defined by a mathematical equation. 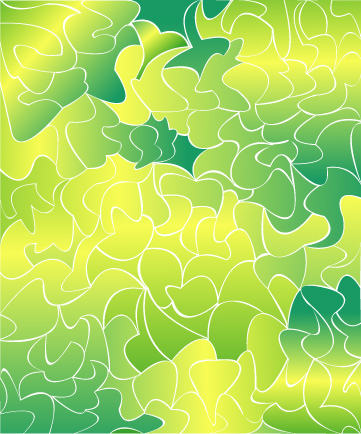 Using a vector-based application, like Illustrator, you can create precise lines and shapes with any stroke weight, fill them with color, pattern or make them transparent. Unlike bitmap images, vector images are not resolution dependent. This means each vector object is scalable and can be resized without any loss of image quality. 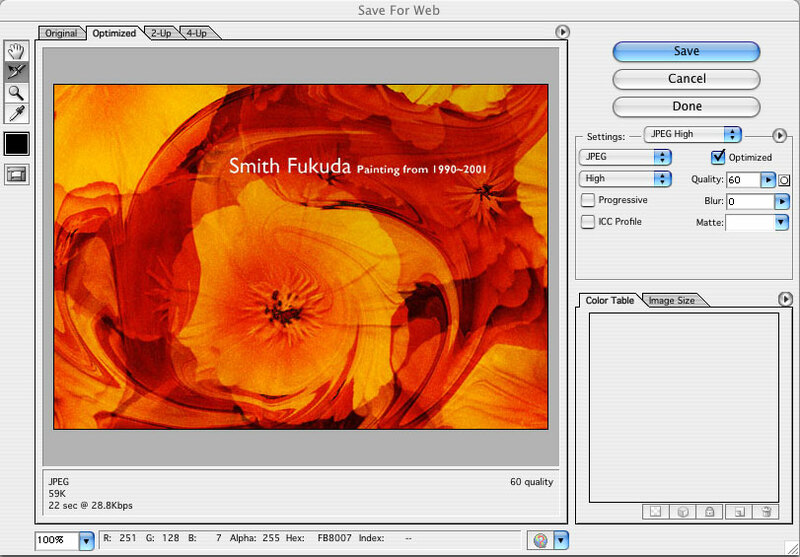 Raster-based applications are ideal for creating painterly effects and photographic images. Photoshop is usually used for this type of image. Bitmap art is created from pixels on a grid. Unlike vector art, bitmap art loses detail when scaled to a larger size. Vector-based (object-orientated) programs are ideal for creating sharp, smooth, graphic images, like logos and type. 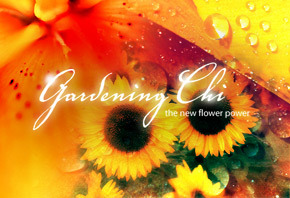 Illustrator is usually used for this type of image. Vector images look sharp when scaled, or regardless of the size displayed or printed. recoloring, resizing, reshaping a part of an image will only effect the pixels selected in that image, not the entire object. no background, not restricted to a rectangular shape like bitmaps. vector objects can be placed over other objects, and the object below will show through. This entry was posted in Class 1, Lecture and tagged bitmap, vector on September 1, 2009 by admin.